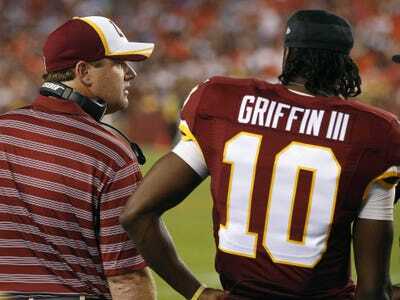 Geoff Burke/USA TODAY SportsRGIII’s biggest problem may be an incurable mental block. Former Washington Redskins tight end Chris Cooley now hosts a radio show on ESPN Radio and recently spent a segment giving a very detailed look at everything Robert Griffin III did wrong during the team’s recent loss to the Tampa Bay Buccaneers. The analysis, which can be seen in detail in The Washington Post, concludes that RGIII failed at almost all of the basics of being an NFL quarterback including missing basic reads, not seeing wide-open receivers, misreading the defenses, and failing to run the team’s offence. It got so bad that, Cooley says, the coaching staff eventually had to switch to what Cooley called a “Day-One offence,” the absolute basics. It is an absolutely scathing analysis backed up with plenty of details from the game that leaves you shaking your head at the realisation of just how bad it has gotten for a quarterback who once seemed destined for greatness but has now been benched. The most famous case came in during the 2000 MLB playoffs when the St. Louis Cardinals’ young star pitcher Rick Ankiel suddenly lost the ability to aim his pitches. Ankiel never recovered and eventually reinvented himself as an outfielder. Unfortunately for Griffin, there probably won’t be a chance for him to switch positions — so if he can’t fix the yips, they could end his career.